Terry plastic multipurpose containers are perfect for those who need a quick solution to tidy up their home or work space. In the catalog of Mister Worker™ are available in various sizes and in various colors, to be chosen according to the use that must be done. Having practical and resistant containers is always useful, both because they allow you to put old items in order quickly, and because they can come in handy for storing documents, moving bulky tools and so on. Terry multi-purpose boxes are ideal for organizing your space to the full, because they are capacious, light and resistant. 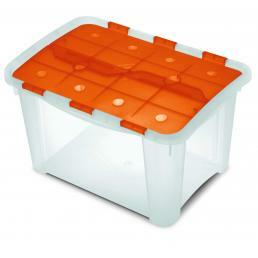 From Mr. Worker™ there are various models of Terry plastic boxes, available in different colors and numerous sizes. They are all made of high-quality plastic, light but resistant, shock-proof and scratch-resistant: moreover, they have practical side handles to move them easily from one place to another, without great effort. If you are looking for boxes and containers to reorganize the spaces in your workshop, the best choice is the Terry Home Box Unbreakable: it is an indestructible plastic container, ultra resistant and shockproof, made with special plastics. 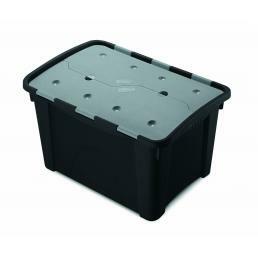 Easily washable and with a lid, it is the best choice for those who work in places where it often happens to involuntarily bump what is around: it is the perfect Terry container for storing tools and power tools when they are not needed. It is black with a gray lid, and is available in 40-liter and 60-liter sizes. Whether you need to tidy up your home or your mechanical workshop, with Terry plastic containers, you're sure!